Expway, the LTE Broadcast expert and leader, Bittium, the manufacturer of reliable and secure Bittium Tough Mobile, and innovative MC-PTT (Mission-Critical Push-To-Talk) provider Nemergent, today announced the successful demonstration of a 3GPP Rel13 compliant end-to-end multicast group calls with Mission Critical eMBMS (evolved Multimedia Broadcast Multicast Services) bearers. “We are fully committed to support mission-critical-push-to-talk (MCPTT) technology,” said Jose Oscar Fajardo, CEO at Nemergent Solutions SL. “Integrating our MCPTT product with Expway’s LTE Broadcast server and client middleware, and with the Bittium devices is a logical progression of the company’s commitment to interoperable communications." “It was our pleasure to work with companies like Expway and Nemergent in this demonstration,” Said Tero Savolainen, Vice President in Bittium. 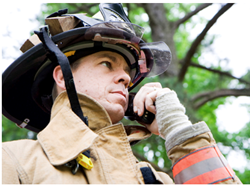 “With a reliable and standards based solution, agencies can adopt broadband devices and services for their first responders and also utilize the potential besides MC-PTT, including video, situational awareness and other data applications."